You'll discover tucked-away gems like Arapaho National Wildlife Refuge and Winding River Resort Stables. Step out of the city life by going to Colorado River Headwaters Scenic Byway and Ouzel Falls. 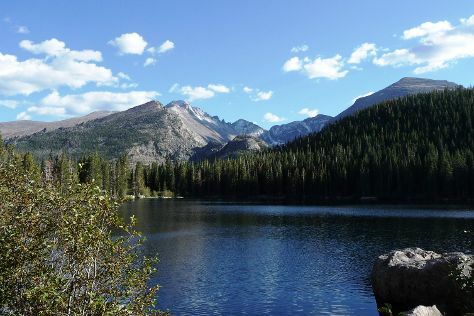 Get out of town with these interesting Rocky Mountain National Park side-trips: Brainard Lake Recreation Area (in Ward), Granby (Granby Library, High Country Trails, & more) and St Mary's Glacier (in Idaho Springs). There's still lots to do: hike along Emerald Lake Trail, contemplate the waterfront views at Mills Lake, cruise along Trail Ridge Road, and explore and take pictures at Old Fall River Road. For traveler tips, other places to visit, where to stay, and more tourist information, read our Rocky Mountain National Park driving holiday planning website . Des Plaines to Rocky Mountain National Park is an approximately 6.5-hour flight. You can also drive. The time zone difference when traveling from Des Plaines to Rocky Mountain National Park is minus 1 hour. Traveling from Des Plaines in July, expect nights in Rocky Mountain National Park to be slightly colder, around 59°F, while days are a bit warmer, around 91°F. Wrap up your sightseeing on the 20th (Sat) early enough to travel back home.